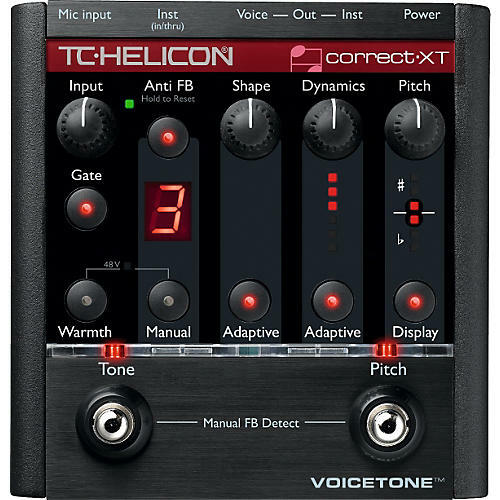 TC Helicon's VoiceTone Correct XT provides you with smooth, pro vocal tones and the security of active anti-feedback. Matched with TC-Helicon's natural auto-chromatic pitch correction, it's like having a live sound engineer and a vocal coach at every gig. VoiceTone Correct XT features TC-Helicon's adaptive tone technology which intelligently controls Shape EQ and Dynamics (Compression & De-ess) to provide the perfect tonal balance that fits in the mix. Best of all, it's easy-just set and forget. The adaptive gate can also be added to help suppress feedback and clean up noise. Feedback is a reality for the contemporary vocalist. Unlike other anti-feedback technology, VoiceTone Correct XT doesn't require any pre-calibration in a quiet room before your gig-who has time for that anyway? Once again it's set and forget-protecting everyone's ears. The VoiceTone Correct XT has balanced XLR output for sending a clean, quiet signal to your mixer. The mic input gives you a studio quality mic preamp with phantom power while the instrument input XLR output can used as a conventional balanced DI connection. There is also a USB output to connect you to Voice-Support which offers tips, tricks, and updates. Mic Connector: Balanced XLR, input impedance 1k? Instrument Input Connector: Unbalanced 1/4?, input imp. 1M? EIN: -126dBu @ max mic amp gain, Rg = 150 ? Instrument Thru output impedance: 270 ?